All 26 episodes of classic Jonny Quest (1964-65 series) are available on DVD! Follow this link for details. Amazon.com has the DVD collection up for ordering on their website; you can get your own DVD set today! This is our number one recommendation for acquiring Jonny Quest episodes. The rest of this page shows the known commercial videotapes with classic Jonny Quest episodes on them. A moratorium was placed on the sale of the Hanna-Barbera videotapes and laserdiscs in 1992 and they are hard to find. After each title on the tape, any deficiencies regarding the starting sequence, title card and end credits are listed. Follow links where present to see larger images or additional information. Refer to the summary charts at the bottom of this page for a quick reference. This video was released in a hard case with this cover by Worldvision Home Video. © 1986 Hanna-Barbera Productions, Inc. as to cartoon characters and packaging. The back cover incorrectly states it includes Arctic Splashdown. Laserdisc version of HB1225, with one episode in SP and the others in EP. U.K. version had same artwork but slightly different design. Probably released like this in the U.K. as well. A laserdisc version of "HB1309." Columbia Video Disk (laser disk) distributed in Japan. Dubbed in Japanese. 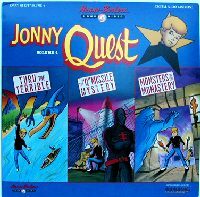 Classic Jonny Quest: Dr. Zin in "Master of Evil"
Package included comicbook adaptation of Turu the Terrible (re-released without comic in 1997). 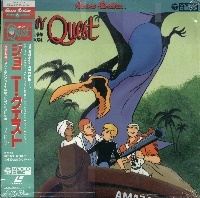 Classic Jonny Quest: Hadji in "Mysteries of the East"
Package included comicbook adaptation of The Quetong Missile Mystery (re-released without comic in 1997). Classic Jonny Quest: Race Bannon in "An Army of One"
Package included comicbook adaptation of The Devil's Tower (re-released without comic in 1997). Classic Jonny Quest: Bandit in "Adventure's Best Friend"
Package included comicbook adaptation of Skull and Double Crossbones (re-released without comic in 1997). Promotional Screener Video for: Classic Jonny Quest: Race Bannon in "An Army of One"
Classic Jonny Quest Video Promo Screener! Episodes include Race Bannon in the classic "Mystery of the Lizard Men" and "Double Danger". Video also includes a old classic Space Ghost episode and a Dexter's Lab cartoon. Also has special information, extended clips, and promotional info. This appears to be a promotional pre-release of H1189V, above, with a slightly different cover. (Aside from the "promo" text, and the different positioning of the title, compare Race's face on this box with the one for H1189V.) Also, check out the contents of the back of the video box for other differences from H1189V. This appears to be a promotional video for the Boomerang Channel's Boomeraction programming. No ISBN number or UPC box on slipcase. The following movies are referred to as "Classic JQ", but don't be fooled! VHS from the Netherlands containing "The Curse of Anubis" and one other episode (unknown title). It's possible this is a bootleg tape, which is why it is not included in the episode tape summary below.